Kazuko Kayasuga Matthews was born Southern California and was raised in Japan. After she returned to the United States, she attended Mt. San Antonio College, and Chouinard Art Institude, where she studied with Otto and Vivica Heino. 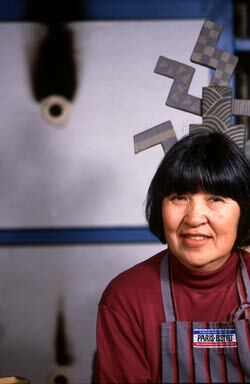 Following a career in graphics, she chose to devote all her time to ceramics, attending Santa Monica College and Scripps College, where she was a student of Paul Soldner. My Japanese heritage and sensitivity is definitely an important foundation of my work, especially in the beginning of my career. Today, having lived in the United States for more than half of my life, there is a broader fusion of the two cultures in myself as an artist. America with its vast space and carefree environment has given me the sense of unbounded freedom to explore and play. Certain things or events, whether experienced fleetingly or in a small way, bring me joy and excitement. The process of interpreting these feelings becomes exploration for new expression. Each new work presents a chance to create new expression, new annotation, new phrase. The way I juxtapose patterns, and the way I play with the dimensions and the space, are all part of my explorative process.